This article will tell a bit about what to look for when choosing the best grocery delivery service. Apart from our usual top 5 list, we are also going to discuss the difference between shopping online and actually going to the market. What’s the difference between getting your veggies online and heading to the market? Well, for starters, picture a typical trip to your local supermarket: overcrowded checkouts, children crying for no apparent reason, clients yelling at the staff over mislabeled product – sounds like a scene from an absurd play. Unfortunately, this is what we have to deal with when we decide to go shopping. And, perhaps, this is one of the reasons why e-commerce has begun to flourish. Why should anyone go through this ordeal when there’s an easier way to do it? Learn how to choose the best grocery delivery service. 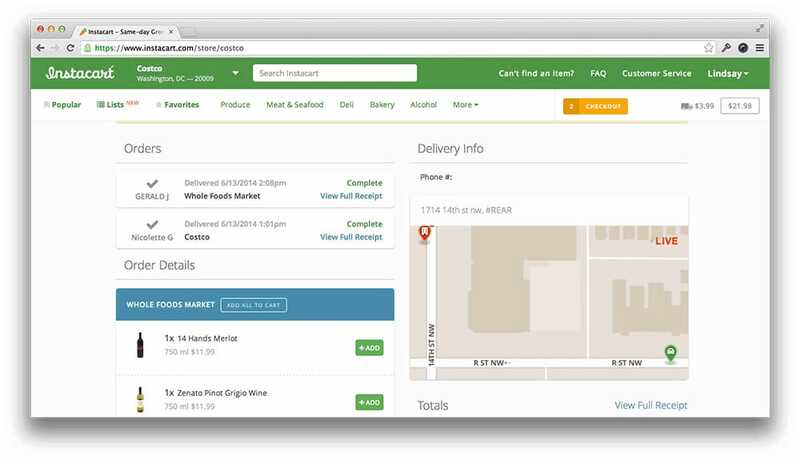 We are going to show you how to search for the best grocery delivery service. This includes aspects like best prices, delivery schedules and the diversity of products. 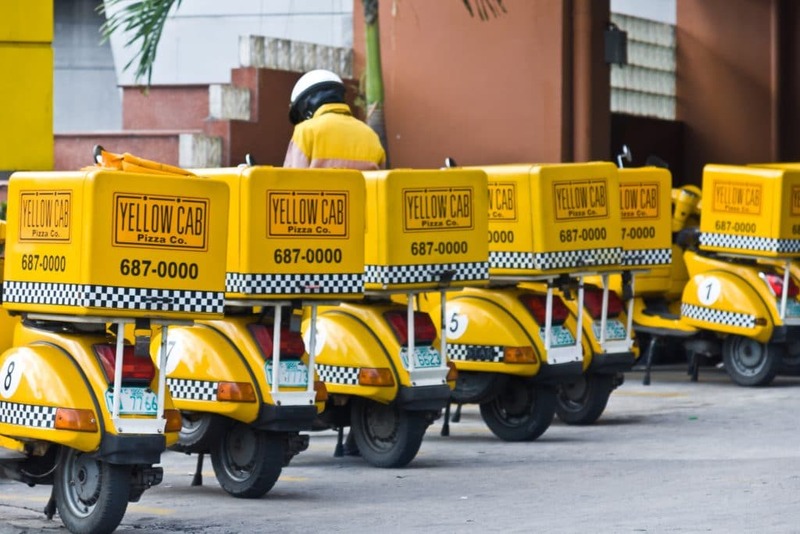 Here are out top 5 choices in best grocery delivery services. The first contestant on our list is the Blue Apron online market. We should mention that this is not your typical online grocery store. When accessing their site, the users will get the feeling that they’ve actually opened a cookbook and not a grocery store. Blue Apron is founded on three pillars: fresh ingredients, which, according to their disclaimer, were harvested from organic, family-run farms, original weekly recipes, and convenient delivery. Their website looks like a combination between a farmer’s market catalog and a cookbook. Apart from the lists of veggies, fruits and meats you can order from Blue Apron, they also teach what you can do with them. So, if you don’t know what to cook for your Sunday family dinner, Blue Apron can show you a few original recipes. Ordering from the site is pretty easy. All you have to do is to create and account, fill in a couple of delivery details and select a method of payment. The site also lets you order meals either for two persons or the whole family. 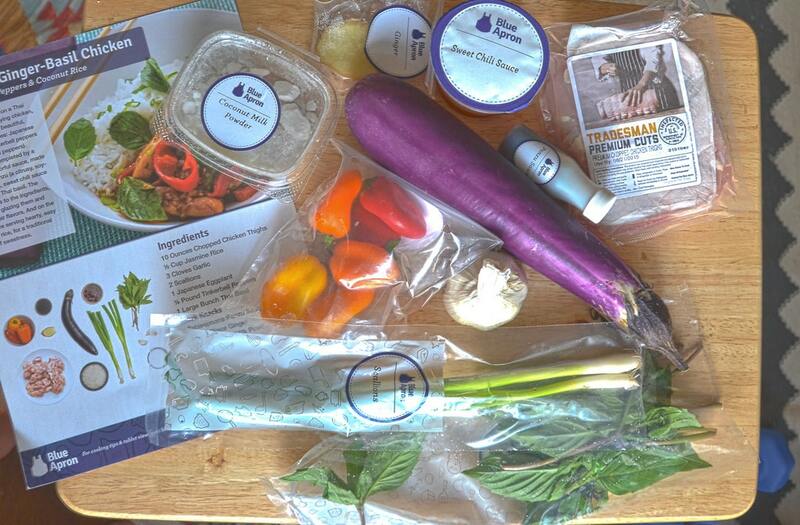 If you choose a meal plan, then Blue Apron will ship the items in your basket for free. There’s also the possibility of choosing the day of delivery. For example, if you’re not at home during a particular day of the week, during the ordering process you can specify the day you wish to receive the products. Instacart is your best bet when it comes to delivering freshly-harvested vegetables. Using the user-friendly interface, you can have your choice of fresh vegetables delivered to your front door in one hour or less. To order from Instacart, create an account and start perusing the shopping list. Add them to your cart, select a location and a method of payment. The site will tell you exactly when the order arrives. Like Blue Apron, Instacart also offers their customers the possibility of scheduling their orders. As a bonus, if your order exceeds 35 dollars, then the service will deliver your products for free. Remember those grocery stores where you could find basically everything? Well, this is the online version of a universal grocery store. 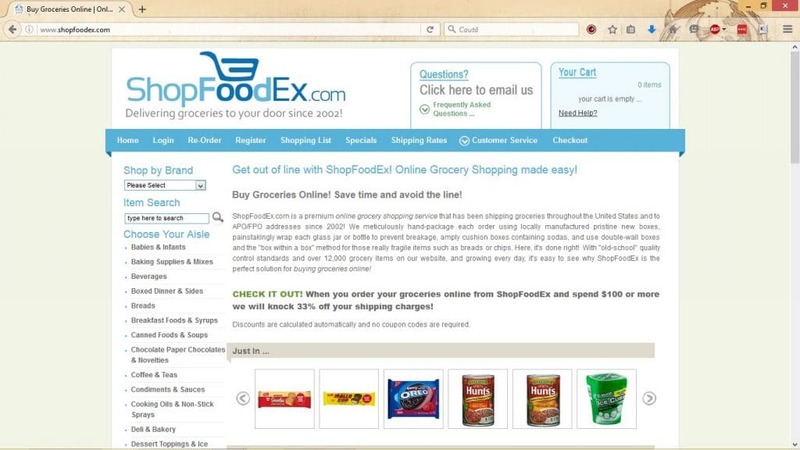 On ShopFoodEx.com, you can find anything you need, beginning with baby and infant food, and ending with seasonal food, spices, beverages and pet food. Ordering from the site is easy and convenient as well. ShopFoodEx works with FedEx, so you can rest assured that the order reaches you in time. Another positive aspect of ordering your items of ShopFoodEx is that the site delivers all over the United States, and it even works with all Military Post Office. Discounts are automatically calculated on the website based on the quantity you want to acquire. ShopFoodEx is best suited for those who want to buy bulk items. Netgrocer is an excellent way to purchase organic vegetables and to find out the latest recipe. But Netgrocer is not restricted to vegetables. Users can also buy beauty products, consumables, electronics, beverages and pet food. Like ShopFoodEx, Netgrocer also works with FedEx, which means that the site can deliver the products to your front door. 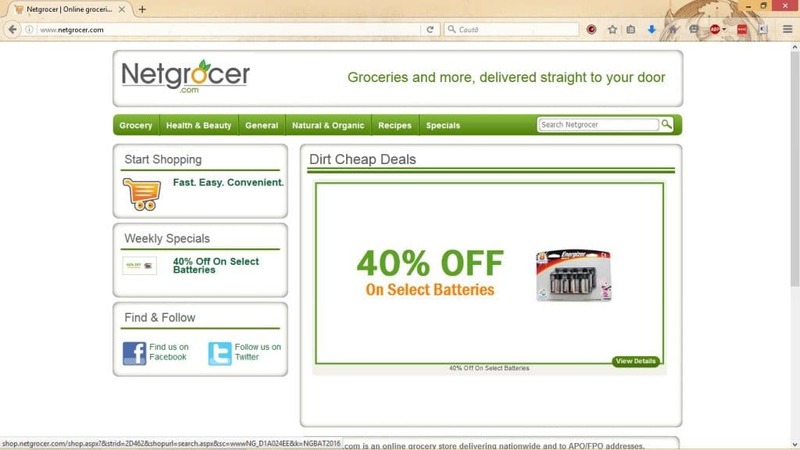 A positive aspect of using Netgrocer is the weekly discount feature. Each week, the site offers a discount for certain items. For example, this week the buyer can purchase Duracell batteries with a 40 percent discount. All we can say is that the Amazon.com is like a labyrinth, where one can get lost so easily. Apart from electronics, Amazon has a Gourmet and Food section, where users can acquire their favorite foods and drinks. Amazon is our number one choice in delivery service because it offers a broad variety of produces. From coffee, tea and beverages to meats and special dishes like kosher, Amazon is the way to go. Also, when it comes to fresh vegetables, Amazon has a special section called Amazon Fresh. All you need to do to get those fresh veggies to your front door is to create an account on Amazon.com and start perusing their offer. Moreover, in order to keep up with the ever-increasing competition, Amazon offers various bonuses to subscribers. For example, those who want to subscribe to the website will now be able to save 15 percent when ordering directly from the site. Those were our top 5 choices in the best delivery service category. Each of the platforms has their ups and down so it would be wise to read their policies before ordering your items. Look for the best deals. Don’t pick up the first site your see. Try to compare them to see which one has the best deals. Delivery areas. 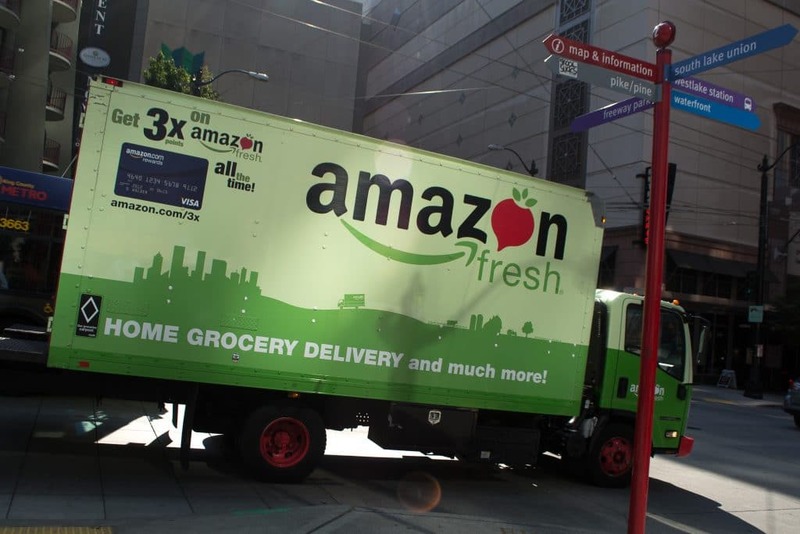 Some grocery delivery services like Amazon have a well-defined delivery area. Check their policy to see if they can reach your address. Delivery times should be taken as a rough guide. Don’t expect someone to deliver your stuff in one hour even if the site says so. Delivery schedules can be influenced by several factors, most of them being uncontrollable. Don’t give up on traditional shopping. There are some things that you cannot simply do on a web page, like hand-picking your vegetables or taking a closer look at the meat cut. Look at the feedback page. You’d get a better idea about the site if you took a closer look at what other had to say. Before we go, let’s give a verdict. The pros of using an online grocery service are easy to understand: it’s fast, you skip the whole waiting in line play, and there are more discounts. On the other hand, there are a few cons of buying all your stuff from the web. For example, your delivery might be late. Also, there might be a slight change of overbuying items, which you don’t actually need in your pantry. And there’s the occasional mix-up, which means that there’s a slight possibility that you might end up with someone else’s order. This was our choice in the best delivery service category. Keep these things in mind and you won’t have any trouble ordering your favorite veggies or meats from the online store. Hey Buddy!, I found this information for you: "Best Grocery Delivery Service – How to Choose". Here is the website link: https://all2door.com/best-grocery-delivery-service-choose/. Thank you.